Taiwanese actress/singer, Rainie Yang (楊丞琳) attended the 15th Global Chinese Channel V Award on April 16, 2011 in Chengdu, China. 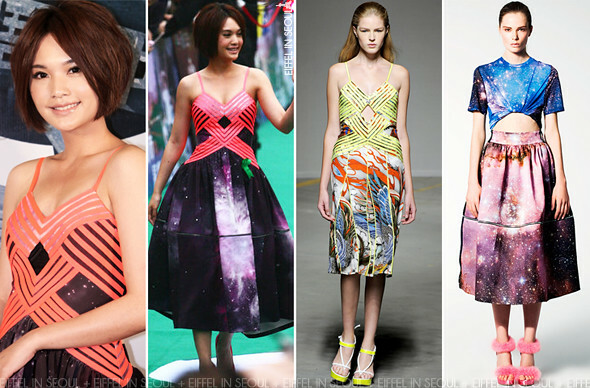 The singer/actress who was awarded 'HK/TW Best Female Actress' was dressed in a modified dress with Christopher Kane designs from Spring/Summer 2011 as well as Resort 2011. She completes her outfit with just a pair of red pumps. Whether she got the people at Christopher Kane to modify the dress or her own stylist to get the dress done, lets leave the debate for another time. I thought Rainie Yang (楊丞琳) looks great in the dress, we don't get to see her in a dress which is over-the-knee all the time. I'm not too sure about the hair though.